The Design Challenge: Illustrate the challenges facing shippers tasked with transporting “cold chain” goods (i.e. food and other perishables). The Solution: The article’s focus was on three primary dangers facing cold chain transportation—contamination, temperature, and regulatory requirements. 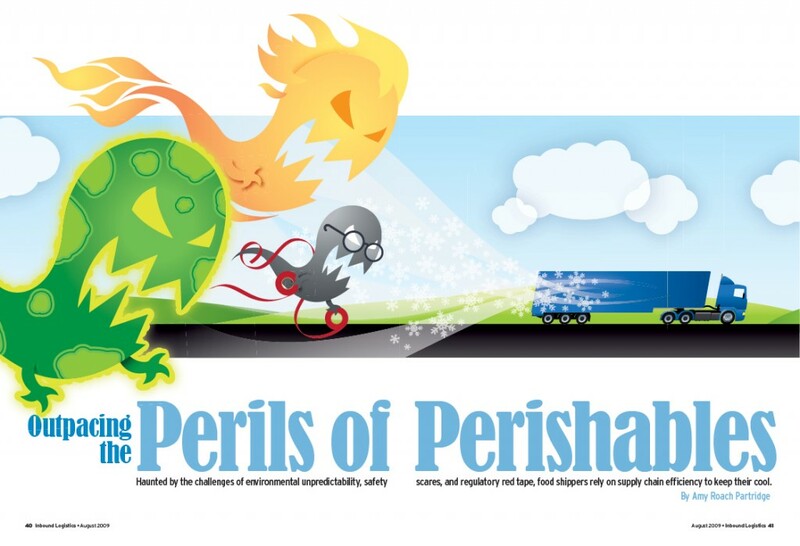 These three “perils” were personified as creatures pursuing a temperature-controlled truck, with the regulatory peril shown as a bookish creature wielding rolls of red tape. Behind the Scenes: After initial sketches, the artwork was built as vector art entirely in Adobe Illustrator from one “base” creature, which was then duplicated and customized into the individual germ, heat, and bureaucrat creatures. The individual creatures were used within the body of the article separately by placing the same master illustration multiple times, but using InDesign’s Object Layer Options to display only the desired creature in each instance. Later, an animated version of the artwork (shown below) was created from the same placed Illustrator file using InDesign CS5′s multimedia features.